Pineapple as a leather alternative? Pineapple as a leather alternative? yes! 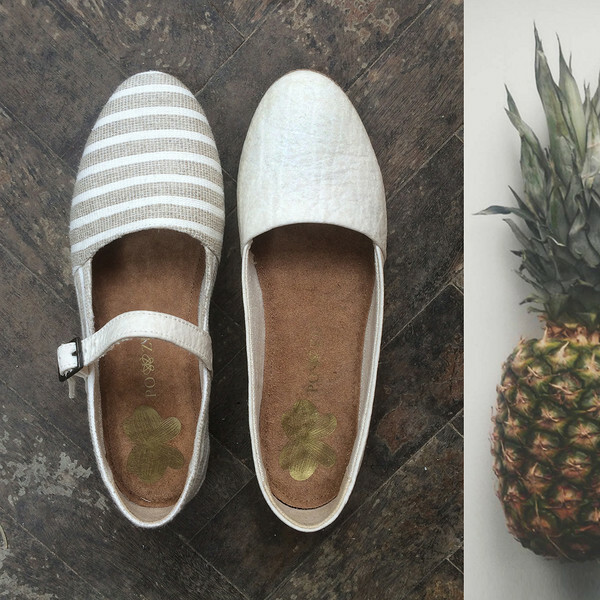 Po-Zu are a fabulous footwear brand, designed here in London; and this Spring sees the launch of an exciting collaboration with Pinatex, and the whole circular economy of using what would be seen as waste product (pineapple leaves!) and natural products such as coconut fibres and latex (in the soles of the shoes) and no toxic glues (they are all hand stitched) so that the shoes can be disassembled…. Zero Waste right there! Po-Zu Shoes are launching a new range of ballet pumps made from Pinatex, an innovative pineapple-based material. These shoes are some of the first products on the market made using Pinatex. What IS Pinatex? It’s a new leather-substitute material made from pineapple leaf fibres. Dr Carmen Hijosa, CEO of Ananas Anam Ltd, has spent the last seven years researching and developing Pinatex. While working in the Philipines, Carmen discovered the qualities of pineapple leaf fibres, including their fineness and strength. She began to explore possible ways to develop a new textile material that could be used as a replacement for leather. Not only is Pinatex a breathable, biodegradable vegan material, the pineapple leaf fibres are a natural by-product of the pineapple harvest, using a material that would otherwise have gone to waste. No extra water, land, fertilisers or pesticides are required to produce them. In addition to the environmental benefits that this brings, it means extra income for the pineapple farming communities in the Philipines.